Great news! American families now have more access with very affordable flights to one of the world’s great cities – Mexico City — a destination packed with family activities and attractions. Viva Aerobus has just launched new air service between New York and Mexico City, nearly five years to the day after these two vibrant cultural capitals became tourism marketing partners. 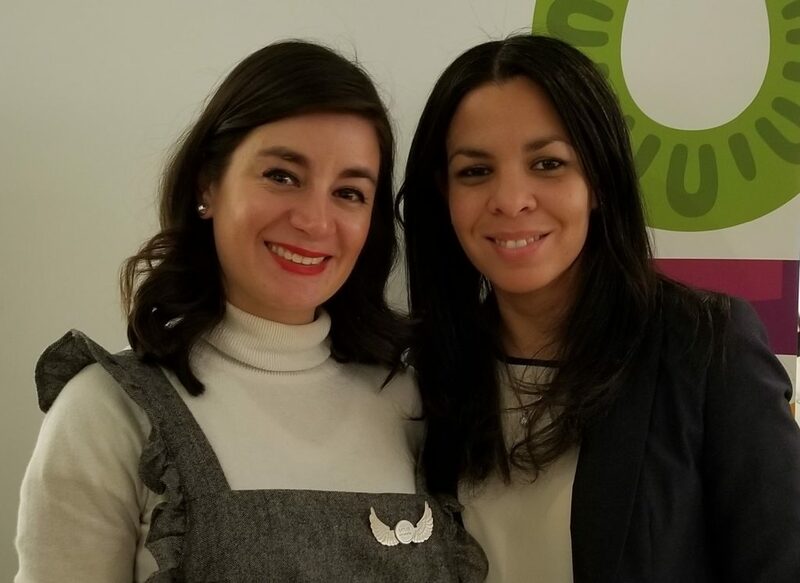 While Daniela Leaman of Mexico Tourism Board (L) encourages Americans to visit Mexico, Lisa Tejeda of NYC & Company (R) promotes New York City to Latin American and Hispanic travelers. Flashback to October of 2013, when NYC & Company, New York City’s tourism marketing association, announced a yearlong city-to-city advertising exchange. In Mexico City, images of Times Square and 5th Avenue department stores appeared in newspapers and on radio; in New York, shots of Chapultepec Park and elegant Mexican restaurants sprang up on bus stop shelters. Five years and many expansions and renewals of that agreement later, the goals are similar, even if the players have changed. At the Viva Aerobus press event, Daniela Leaman, Deputy Director Mexico Tourism Board, and Lisa Tejeda, Director Tourism Marketing Development in the Latin America and USA Hispanic Markets for NYC & Company, said that this latest development was an exciting new chapter in their efforts to promote both cities. Viva Aerobus, an ultra-low-cost carrier, is now offering daily flights between JFK and the Mexico City International Airport. With fares beginning at US$100 each way (rates lowest midweek) and up to 135,000 seats available in the first year, expectations are high. Juan Carlos Zuazua, the young CEO of Viva Aerobus, talked about the thrill of arriving at New York’s JFK with his toddler in tow. The flights are scheduled so that visitors can “have brunch in SoHo and dinner in Mexico City” on the same day, he joked, adding that it’s cheaper to fly to Mexico City for a gourmet meal than to dine in New York. Zuazua noted that more than 500,000 Mexicans traveled to New York City on other carriers in 2017. It is Viva Aerobus’ first call on New York after 12 years of operating in Mexico and the E.U., flying 102 non–stop routes to 44 destinations. Mexico’s Consul General in New York, Diego Gomez Pickering, with Aerobus CEO, Juan Carlos Zuazua, at the launch event in NYC. Representatives from the transport hubs and governmental officials were enthusiastic about the economic benefits that Viva Aerobus was bringing to both destinations. Consul General of Mexico to New York Diego Gomez Pickering noted, “We are confident that this new route will become a catalyst for the increase of US visitors to Mexico and vice versa.” Alfonso Sumano, Executive Director of Mexico’s Tourism Board, agreed, adding that Mexico was already the number one destination in Latin America in 2017, and the sixth most visited country in the world. 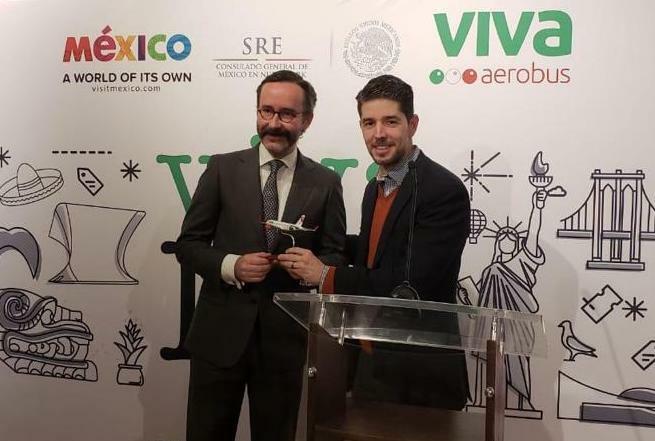 We heard that Viva Aerobus’ flight transported several of Mexico’s top influencers to New York to share their impressions of the service and destinations served, contributing to the strong push the airline has received from more conventional channels. And we’re happy to spread the word. Zuazua concluded the evening by emphasizing Viva’s benefits for travelers: “low prices, customer focus, personalized trips, operational efficiency, advanced technology and one of the youngest fleets in the world.” Of course, all will be welcomed by families traveling during the busy holiday season. Heads up! Like most ultra-low-cost carriers, Viva Aerobus has three basic fare classes — VivaLight (up to 10kg carryon), VivaBasic (10kg carryon plus 15kg checked bag) and VivaSmart (which includes the above, reserved seats and flexibility in cancellation), so the leading $100 fare won’t apply to most families traveling. Still, it’s a great addition to the marketplace and a real bargain, serving a low cost destination. For flights information and ticketing, visit Viva Aerobus or contact the Call Center 0181 82 150 150.